Searching for an affordable blend of beauty and durability for your new	floor? 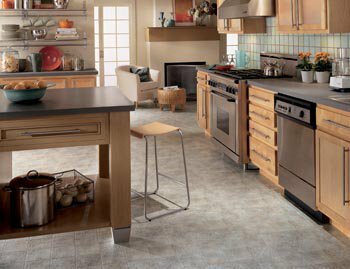 Turn to our reputable flooring store for numerous selections of	high-quality, low-cost vinyl flooring. With recent advancements in technology and the use of digitally created	designs, vinyl flooring installation is becoming more popular than ever	for homeowners. Between vinyl plank floors and tile floors, you can have	the look of	hardwood or	natural stone for less and without all the upkeep associated with those materials. Choose any color or pattern you like and save. We offer an extensive selection	of attractive luxury vinyl tile flooring options so you can save money	without sacrificing quality or style. Stop by our showroom to see our	stunning collections of vinyl floors. Our flooring specialists and installation	professionals will help you every step of the way—from selection	to installation. A new dimension in beautiful, comfortable flooring. The unique construction of Earthscapes provides a comfortable and long-lasting	choice for carefree everyday living with style. With beautiful designs	and textures that so closely mimic hardwood and ceramic you will want	to reach out and touch them. Earthscapes can be enjoyed in any room in	your home. It’s even a great solution for areas where moisture might	be a problem. Designed to perform, layer by layer. Earthscapes is an amazing cushioned vinyl. Its secret lies in its layers. Technologically advanced, this unique flooring features a layer of fiberglass	fully encapsulated with PVC vinyl for complete dimensional stability,	a comfort foam cushion, and a urethane wear layer that is highly resistant	to stains and traffic. The foam cushion layer of Earthscapes’ construction provides warmth	and comfort. Its exceptional acoustic advantages mean you can enjoy a	more peaceful home. 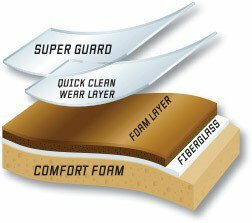 The urethane wear layer ensures Earthscapes’ durability. You’ll	love the resistance to the contraction, expansion, curling and cracking	typically associated with older vinyl technology. Earthscapes is extra wide for virtually seamless installation. The process	is quicker and cleaner than regular wood and stone products, and in many	instances it can even be installed over old vinyl. Sub floor preparation	is easier, too. If you don’t love your new floor, we’ll replace it for free	— including installation. A beautiful alternative to tile, stone or hardwood. Invincible™ LVT is Carpet One Floor & Home’s premier luxury	vinyl tile collection. Beauty, durability and easy maintenance make this	the perfect choice for today’s modern lifestyle. Invincible™ LVT vinyl plank flooring offers the ease of maintenance	and the durability that you seek in vinyl with the incredible natural	look only today’s manufacturing techniques can deliver. It’s	the look of the real thing at an unreal value. Intensity Surface Shield™ provides a super-tough waterproof wear	layer to protect against scuffs, scratches and dirt with minimal maintenance. This helps preserve the LVT flooring’s natural appearance for years to come. Intelligent Support System provides sound absorption and flexible, adaptable	installation for exceptional comfort and durability in this vinyl plank flooring. Moistureloc™ creates a watertight seal that never loosens even under	tension. Moistureloc™ ensures that water and dust won’t get	under the floor, preventing mold and other micro-organisms from forming. Superbase™ Construction features a 100% dimensionally stable fiberglass	core that allows the luxury vinyl flooring to adapt to all environmental	conditions and prevents buckling and gaps. Enhance the beauty of your home with flooring that’s sure to stand	the test of time with Invincible™ LVT luxury vinyl flooring. Engineered with real stone for lasting and durable beauty. 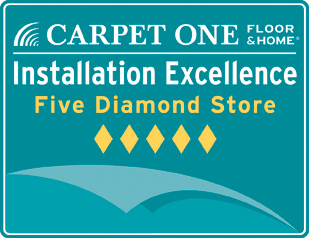 VERO‾STONE™ from Carpet One Floor and Home	® welcomes you to the best of both worlds. The impressive look of authentic	stone without the worry of chips or cracks. Durable and long-lasting,	yet comfortable for the whole family — even pets! And your family will especially love the warmth and softness engineered	stone floors offer compared to natural stone. In fact, it’s hard to imagine a surface more versatile than VERO‾STONE™. It can be installed with or without grout and over a variety of existing	floors. It never requires sealing and can be installed much faster than	standard stone. Easy vinyl floor care is one of the main reasons why vinyl is the perfect	choice for any family. Its durability stands up to heavy foot traffic	as well as spills. Messes wipe right up off this easy to clean material,	making it ideal for families and those with pets. Worried about scratch marks from pet claws or toys? You can rest easy. As time has passed, new technologies have developed scratch-resistant	vinyl flooring options that are perfect for any home. Any vinyl floors	you install in your home from our company are as resilient as they are stunning. 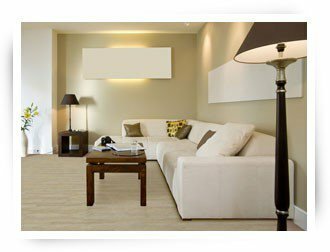 Trust us for beautifully installed vinyl plank floor and tile floor. The	process is far simpler than the installation of other materials, and if	you ever find that you want new vinyl or other flooring option, removal	is less intensive as well. 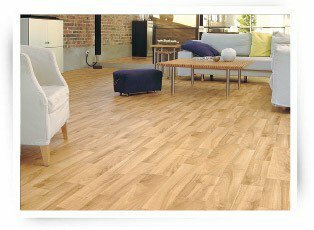 Between easy vinyl floor care and versatile looks, we’re sure you’ll	be thrilled with the results of your new floor. In fact, you can enjoy	complete peace of mind thanks to our Beautiful Guarantee—if you	aren’t completely pleased with your new floor, we’ll replace	it free of charge. Our guarantee is simply another way we go above and	beyond to make your satisfaction our top priority. 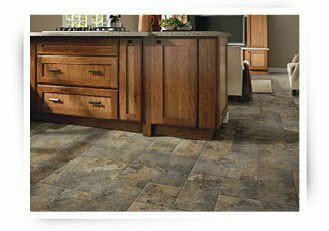 If you love the look of tile or hardwood floors but aren’t pleased	with the price tag or maintenance you’ll have to perform, choose	our luxury vinyl tile flooring or plank flooring. Thanks to innovations	in vinyl manufacturing you can get the look of more expensive flooring	options at a fraction of the price and little maintenance. Come to our showroom today to learn more about vinyl flooring from one of our flooring specialists.